This is one of our most popular do at home activities! 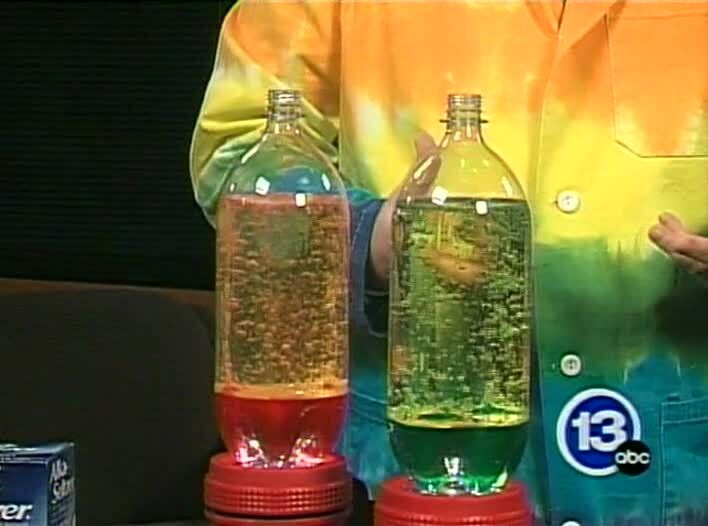 With just a few items from your kitchen you can create a bubbling version of a lava lamp. 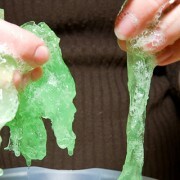 To get started gather up some vegetable oil, water, food coloring, a plastic bottle and some effervescing (the bubbling kind) antacid tablets. 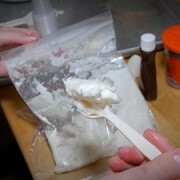 Start by cleaning out the bottle and filling it with about 2 inches of water. Now pour in the vegetable oil to nearly the top. In order to color your lava, you will need to add several drops of food coloring. Notice that the food coloring does not mix or color the oil as the drops sink. Fill the plastic bottle with 2 inches of water. Fill the rest of the way with vegetable oil. Put in 5 or 6 drops of food coloring. Drop in an effervescing antacid tablet and you just made your very own lava lamp. Try putting a flashlight under the bottle see what the lava lamp looks like now! Oil will not mix with water it is an example of a hydrophobic molecule. The term hydrophobic literally means water fearing from the Greek language hydros “water” and phobos “fear”. Food coloring is a hydrophilic molecule. The term hydrophilic literally means water loving from the Greek language hydros “water” and philic “friendship”. The food coloring has the ability to mix or transiently bond with the water (H2O) through hydrogen bonding. When you place the effervescing antacid tablet into the bottle it will dissolve in the water and form bubbles of carbon dioxide gas. The gas rises and takes some of the colored water along with it to the surface of the oil. When all of the gas has escaped out of the top of the bottle the water droplet falls back to the bottom of the bottle. The lava lamp will last for quite some time – but I don’t have a hard number. I’ve used one at work for several months, so maybe I’ve dropped in 20 or so tablets and it still looks good. The water at the bottom may start to look cloudy, but the oil will clear up once it sits for a while. It’s an interesting question though. I think I may try to see just how many tablets can be dissolved in the water before the solution stops fizzing – if that is even possible. In anycase, if you do reach the limit, or the water starts to look funky, you can always pour off the majority of the oil into a new container and add fresh water. I tried this “experiment” and now I’m the new star at my working place with this cool lava lamp! Additionally I’m pretty impressed, that it is supposed to last that long! Thank you so much for this very very cool chemistry, even my son who’s in 9th grade and actually hates both chemistry and physics was quite fascinated!